N.B. Prices are indicative and depend on the current silver and turquoise price and the actual currency rates. Please note that persons holding a Canadian First Nations status card and living and working on their reserve are generally tax exempt. *When ordering please mention the item # of this buckle. The design of this sterling silver belt buckle, with its flowing outlines and explicit narrative character, originates from the deep appreciation jewelry designer Zhaawano feels for his Anishinaabe heritage - a once hidden treasure that Miskwaabik Animikii (Norval Morrisseau) made him aware of in various different ways and levels of consciousness. The graphic overlay design, in which human and animal realms mystically merge, features black-outlined imagery inspired by the sacred texts of Anishinaabe/Algonquian traditional stories. 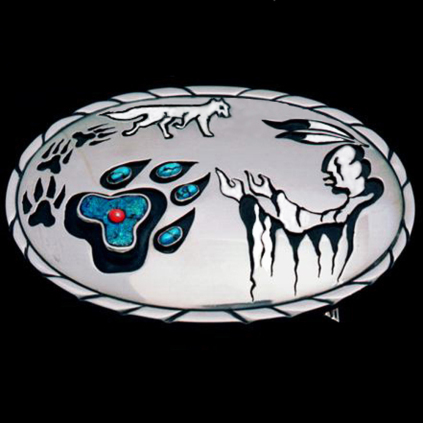 The buckle design, which is reminiscent of the graphic tradition of the New Woodland School of Art, symbolizes an invocation of the Spirit of Ma'iingan (Wolf). It's an appeal for guidance and skills and strength to make the right decisions.